Pollution is posing a great threat to the existence of life on this planet. Plastic pollution magnifies this problem. The number of plastic waste disposed on a yearly basis can go around the earth three times and over. Unfortunately, the final destination of most of these plastic wastes are the oceans as 8 million plastics are estimated to get into the ocean yearly. Plastic pollution poses challenges to wildlife, plants and even humans. Since 2004, about 4 billion plastics have been produced. The extensive use of plastics in clothing, automobiles, electronic gadgets, storage facilities, food packages shows how important the use of plastics can be which accounts for such a rise in production. Sadly, they play a vital role in polluting the environment as they are not biodegradable since they are meant for durability. It is established that 78% of hazardous wastes are plastics. Apart from the threat which improper management of plastics pose to our ecology, our health is also at risk. Plastics, a product of refined crude oil containing Bisphenol-A -a chemical functioning as plasticizers, responsible for the flexibility and durability of the material poses health risks when in contact with food. Africa is no stranger to pollution. The continent has battled with garbage disposal issues for many years. The use of plastic bags account for a large number of landfill dilemmas. The Nile and Niger have been listed amongst the chief culprits of disastrous pollutions of the environment by a recent study conducted in 2017. The large populations living on the river banks are responsible for why the rivers entry points of plastics into the ocean. The devastating effects of poor waste management are so evident in the continent. In Lagos, Nigeria, only 40% of 10,000 tonnes of waste are collected. Nigeria has also had an estimated 349 oil spills, and has lost 80% of the country's forest. The expansion of the middle class in the continent has seen the consumption of more plastics and items contained in plastics than any other time in the history of the continent. Mismanaged wastes from maritime and shipping activities in the continent also find its way into the oceans. Polystyrene buoys that form significant amounts of plastic debris from agricultural processes also end up in oceans or beaches. Other factors identified to influence the movement of plastics into the oceans include human behaviour such as littering, wind, water flows, vehicular transport. The primary sources found to be caused by human practices. 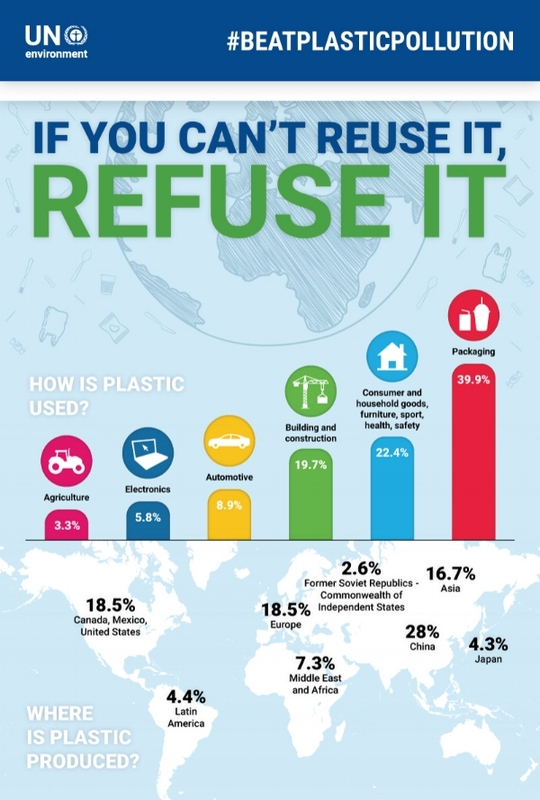 In a bid to address the alarming rise of plastic wastes, many countries have adopted different policies. Many African countries are banning the use of plastic bags. After losing 70% of its livestock to the ingestion of plastics, Mauritania was the first African country to ban plastic wastes. Mali, Cote d'Ivoire, Kenya, Ghana, Ethiopia, Senegal, Uganda and Tanzania have followed suit, while South Africa and Cameroon placed taxes for its use. Retail serves as a great opportunity by which plastic pollution can be beaten. Plastic wastes are being transformed into marketable products for retail. For instance, plastic bags are transformed into school bags for kids; tires are turned to shoes and plastic bottles are being recycled for further use by appropriate agencies. Trash for education is another concept in play to beat plastic pollution. This process involves tapping into informal waste collection and exchanging it for educational vouchers which can be redeemed for online/offline courses or educational materials. The heavier the weight of the trash, the higher the value of the educational voucher awarded to the student. The scheme which is designed by Green Campus Initiative creates value for participants by generating revenue through recycling and reuse of materials, which serves as an employment avenue. To what effect? Let's consider a case study of Grace, a Gambian-born Nigerian living in the western part of the country. Like every other fresher preparing for resumption, Grace had prepared a lengthy list of needs for her first year in higher institution. Grace whose childhood dream has always been to become a Civil Engineer hopes to build sustainable buildings in local communities. Though her farmer dad and her trader mum can be said to be lower middle-class, they have strongly influenced and supported her ambitious dreams. Determined to prepare herself in the best possible way, she made an exhaustive list of items needed to excel in her studies. In a quest to assist her parents as she knew they might not be able to afford all she needed, she enrolled in a paid internship with Green Campus Initiative (GCI). It was during the internship she learnt about the ‘Trash for Education’ programme; a system designed to reward people who trade their valuable wastes and other unused materials with formal education, educational materials and vocational training. That waste could serve as a substitute for money seemed foreign to Grace. However, she saw this as an opportunity to get some items off her list of needs; waste is everywhere, after all! Her parents were super excited when they heard as well. She signed up for the programme. Grace and her parents did not break a sweat fetching the amount of waste that will get her the most coveted item on her list – the Calculus TextBook. Beyond the bargain, Grace was also presented a solar lamp to enable her read at night. Grace vowed to be a vanguard of Trash for education, as she truly believes it is a great scheme that can provide access to education, especially for those struggling to afford it. Plastic pollution affects the food chain as microorganisms become poisoned from ingestion. This poses a bigger problem when fishes and larger animals feed on them which brings plastic poisoning further up the food chain. Clean drinking water is also at risk as plastic poisoning can find its way to humans. This can be due to the interaction of plastics with water in landfills which seeps underground, degrading the water quality. The burning of plastic also releases poisonous chemicals into the atmosphere which leads to respiratory problems when inhaled by humans and animals. The effects of the improper management of plastic wastes are far-reaching, and it is imperative that we start acting fast to curb these effects for the ultimate good of sustaining life and making it better for the planet. We all need to get involved in the process of managing plastic waste. Recycling is an excellent point to start, but it cannot be done solely by a section of society. The world's environmental day gives us a perfect opportunity to remind ourselves to stand up and make more moves in cleaning the planet. We all have a role to play in ensuring that government legislations and independent environmental initiatives come to a realisation. Then and only then, can we truly have a cleaner, safer and better earth.